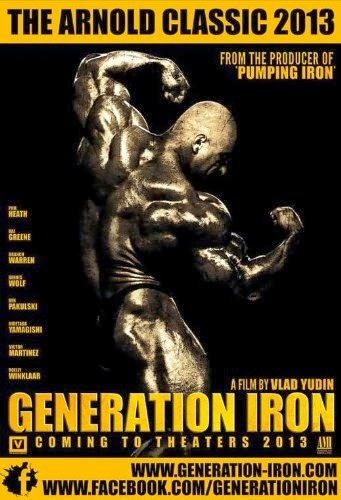 Starz Digital Media presents Director Vlad Yudin’s critically-acclaimed documentary, Generation Iron, from the producer of the 1977 documentary Pumping Iron. Generation Iron takes an honest and in-depth look at the professional sport of bodybuilding today, giving audiences front-row access to the lives of the top seven bodybuilders as they fight to bring home the coveted Mr. Olympia title. Narrated by Academy Award-nominee Mickey Rourke (The Wrestler), Generation Iron will be available on iTunes and other digital platforms on April 4th, On Demand on April 15th, and on DVD on May 13th. NEW YORK, NY – Starz Digital Media presents Director Vlad Yudin’s critically-acclaimed documentary, GENERATION IRON, from the producer of the 1977 documentary Pumping Iron. GENERATION IRON takes an honest and in-depth look at the professional sport of bodybuilding today, giving audiences front-row access to the lives of the top seven bodybuilders as they fight to bring home the coveted Mr. Olympia title. Narrated by Academy Award®-nominee Mickey Rourke (The Wrestler), GENERATION IRON will be available on iTunes and other digital platforms on April 4th, On Demand on April 15th, and on DVD on May 13th. This critically-acclaimed documentary follows seven larger-than-life competitors vying for glory in the 2012 Mr. Olympia, the ultimate bodybuilding contest that catapults its winners into fame and stardom. From the producer of the classic Pumping Iron and narrated by Academy Award®-nominee Mickey Rourke (The Wrestler), this true story of dedication, rivalry, victory, defeat, and triumph follows an array of magnificent bodybuilders as they prepare for, then participate in, the Olympia showdown in Las Vegas. These athletes include 2011 Mr. Olympia-winner Phil Heath, Brooklyn underdog Kai Greene, Texas maverick Branch Warren, Japanese expatriate Hidetada Yamagishi, Germany's Dennis Wolf, Curacao-born Roelly Winklaar, and the forward-thinking Ben Pakulski. Featuring Lou Ferrigno (TV’s “The Incredible Hulk”), Michael Jai White (The Dark Knight, Fast & Furious 7), and more. Digital download bonus footage includes an interview with Lou Ferrigno, as well as a Making-Of featurette.